This is a watercolor I did many years ago when I took an illustration course at the New Hampshire Institute of Art. He has always been one of my favorites. Even though he is a fox (and not a werewolf), I still felt like he is appropriate to wish everyone a Happy Halloween with. Yesterday was another sky class. 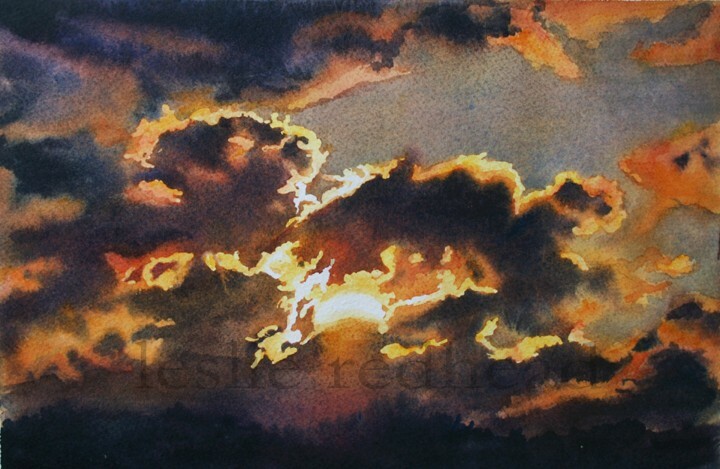 October Sunset is the painting that I demonstrated. I thought the black and orange was appropriate for this time of year. I started another painting with my skies class this past week. Something simple since the last one (Sky Over Rathtrevor) was so detailed. 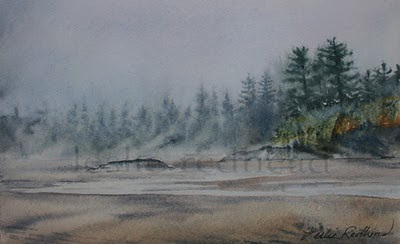 This is one of the beaches of Tofino covered in fog. A normal occurance for the area. I love walking the beaches in the fog though. It is so quiet and I feel like I am the only one there. Great time for thinking. Today is International Artist Day. In celebration of this day each artist on Daily Painter's International has been asked to write about an artist that has influenced them. There are so many wonderful artists that have influenced me that it was hard to choose. I had plans to highlight Andrew Wyeth or John Singer Sargent when I realized that the piece I was working on was directly influenced by local artist, Catherine Moffat. 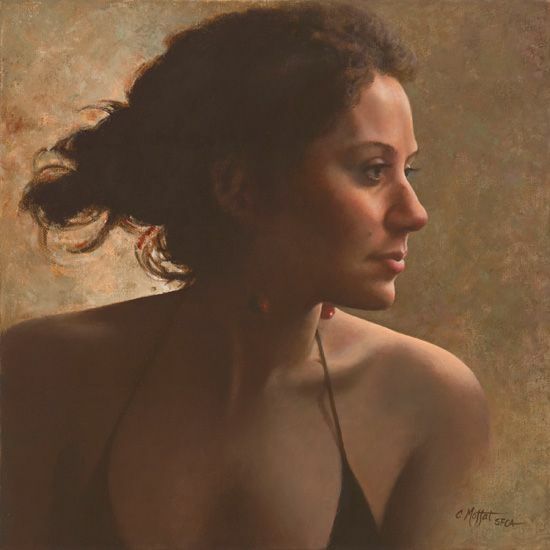 Last Thursday night I had the opportunity to watch Catherine demonstrate a portrait in oil. It has been some time since I have painted in oil but that night I came home and wanted to paint in oil. So I found a small canvas and a photo kicking around the house and started to paint. Jingle Bell is the result. Catherine Moffat is a Victoria artist known for her beautiful portraits and still lifes in oil and watercolor. I am amazed that she is able to do both so wonderfully. 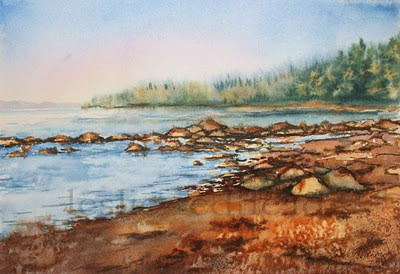 To me, watercolor comes naturally and I have always struggled with oil. I think light to dark (watercolor) instead of dark to light (oil). 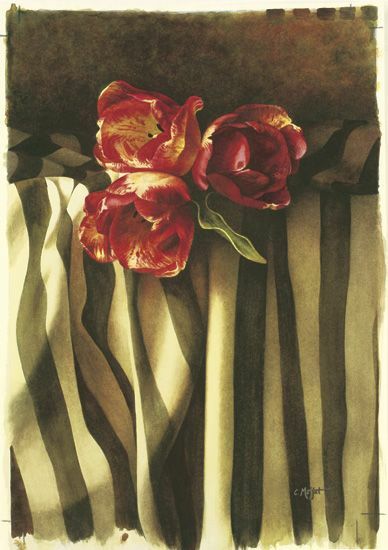 When I had the chance to jury a show with Catherine, I asked her about the transition to oil from watercolor. Her response was that she still struggles with oil (HA!) and she had to stop the watercolor completely as she taught herself to paint in oil. That made me feel so much better! 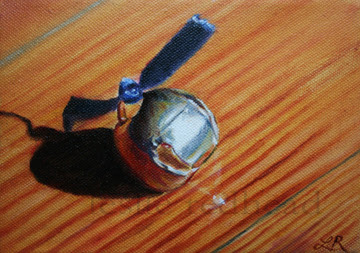 And now that I have the bug for oil again, I may be completing some more soon. My son's friend came over yesterday and asked an interesting question. He asked that if I can control space, matter, or time, which one would I choose? The answer is definitely time! It has been an overwhelming week with classes, kids, house, and the many unfinished projects. If I could control time, I think I would stop it to first have a nap, then read a book, take a bath, and complete all those unfinished paintings that are piling up. 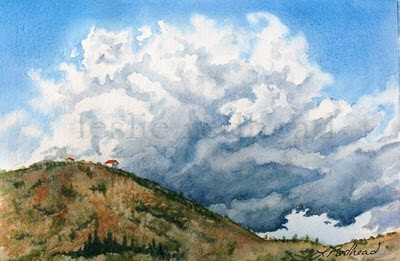 It is always easier to paint when you feel refreshed instead of feeling like your eyes are drooping down to your socks. The kids do have the day off from school today. I thought I would sleep in and wake up slowly. I slept in an extra 30 minutes. Woohoo! Guess my body is use to the early hours so that idea didn't work. At least I got to wander around in my pjs for a couple of hours. Then I insisted the kids take the dog for a walk which was a nice break for me. Now it is back to playing catch up. I do hope I can work on the oil I started last night sometime this weekend. The above painting is from my skies class that I am teaching. It was so detailed that it took me a couple of weeks to complete. 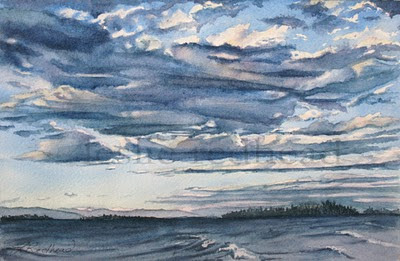 The image is the beautiful sky over Rathtrevor Beach in Parksville, BC. It was a July evening and the wind started to blow. Since the clouds were moving so fast, the sky was constantly changing. Photos galore! So you may not have seen the last of this sky. Prints available through Fine Art America by clicking here. Tonight is the opening for the Sidney Fine Art Show in Sidney, BC. I entered one piece this year and was pleased to discover that it was accepted! 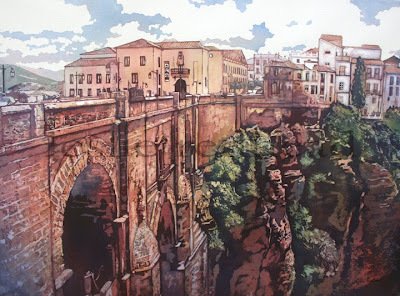 Bridge to Ronda is a poured watercolor of the beautiful and historic Roman bridge that connects the older part of Ronda, Spain with the newer section. It spans the El Tajo Gorge. Along the cliffs of the Gorge are these wonderfully old homes that look like they are barely hanging on. The Sidney Fine Art Show opens tonight and runs throughout the weekend. It is open 9am -9pm both Friday and Saturday. 9am-5pm on Sunday. This past week I taught class on negative painting. It is a fun class for those new to watercolor as well as those that are trying to grasp the negative painting concept. 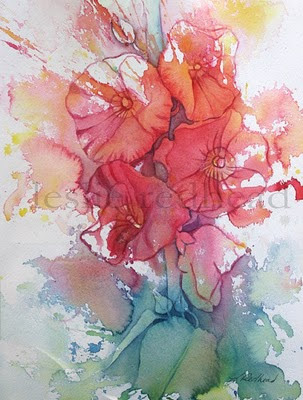 The Hollyhocks I did as an example of what we will accomplish. To begin, I use only my 3 primary colors mixed into liquid form. Then I poured my yellow and red, blew the paint and sprayed it with a spray bottle to move the paint around. Next I poured yellow and blue and repeated the above process, only below the red and yellow. After the paint is dried, I "find" my hollyhocks and my leaves by painting the negative shapes around them. That is how the painting emerges. For more information about my classes, be sure to click on the link to the right that says calendar. To purchase, please visit my Etsy shop or contact me. On my trip to Andalucia, Spain this past June, I discovered that the rain in Spain does not stay mainly on the plain (hahaha - couldn't help myself with that one). The group went there prepared for hot sun and what we got was a few days of showers and cooler weather. However, we also got to see some amazing clouds and it did cool off the weather enough to enjoy ourselves when we were out and about in the different villages. I knew I was teaching a class this fall on skies, so while those amazing clouds raced overhead, I took tons of photos. This is the painting I demonstrated to my class yesterday from one such photo. The painting is matted in a white matte to fit an 11x14" frame. Shipping is free to Canada and the US. This is the other painting I demonstrated at my workshop in Sooke. The painting is of the beach just down from the Ocean Wilderness Inn where Muir Creek mets the ocean. There are some beautiful rocks and the beach is always so quiet. On this particular morning, my daughter and I met two happy dogs and their owner. We were just glad that it was dogs and not bear since bear do happen to wander this beach. Painting is matted in a white matte to fit an 11x14" frame. Shipping is free to Canada and the U.S. 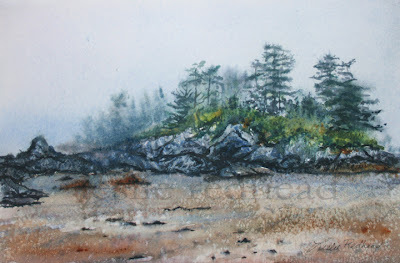 I had a fabulous day in Sooke teaching some budding artists how to do a landscape in watercolor. Sooke is on the southwestern coast of Vancouver Island. It is a beautiful spot that looks across the Strait to the Olympic Mountains. For the workshop, I chose to do the typical west coast scene of evergreen trees, rocks and beach - all enshrouded in fog. 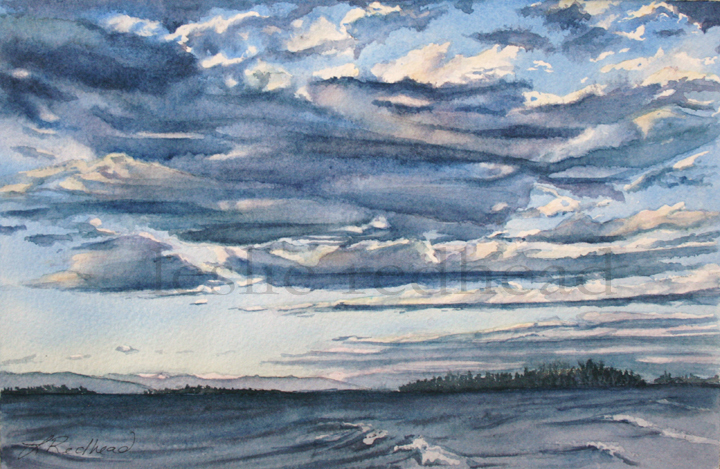 The inspiration for the above painting was Tofino, BC. I have rarely seen Tofino without the fog and/or the rain. However, it is a wonderful place to visit. You have the rainforest on one side of this long sandy beach and the ocean on the other. The fog gives it a mystical and magical feeling. During the summer it is nice to walk the beach anytime of the day. During the winter, the storms provide exciting entertainment. Many visit the area just for the storms that come over the ocean.